Honey is often a less-discussed aspect of the industrial food system. 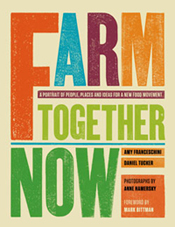 That’s why we were excited to read about 28-year-old Sam Comfort and his upstate New York-based one-man project, Anarchy Apiaries, in Farm Together Now: A Portrait of People, Places, and Ideas for a New Food Movement (Chronicle Books, 2011) by Amy Franceschini and Daniel Tucker. Comfort keeps 300 hives on 15 acres of land. 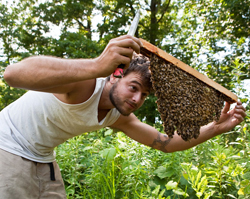 He uses what are referred to as “top-bar hives,” which were developed in Africa and, unlike the standard hives used in the industry today, require the bees to build their own wax combs entirely from scratch each season. He believes that doing so keeps bees active, strong, and more resistant to disease, mites and some of the other possible causes of Colony Collapse Disorder. Comfort is a permaculture student who has also spent time working at an industrial, 5,000-hive operation in Montana, pollinating many large orchards (almond, apples, cherries, etc.) along the West Coast. Below is an excerpt from a longer interview that appears in Farm Together Now. Is it true that in industrial beekeeping bees are fed corn syrup? Yeah, and soy flour for protein. In almond orchards, there would be fourteen hundred hives in one row. Four hives to a pallet. They use a gasoline nozzle–looking thing hooked up to a truck with a three-hundred-gallon tank of corn syrup and fill up the troughs. If they didn’t do that, the bees would die. Some of these bees are taking in twelve to thirteen gallons of corn syrup through the winter just to subsist, just to be alive. They used to be divine creatures in every culture except ours, and now they are just livestock. How is honey part of your project? You just have to know your beekeeper, or anyone who’s growing your food… I like to know my farmers, how they grow, what’s on their bookshelves, the whole deal. What does “treatment-free” beekeeping mean? What some of us are doing now is against the grain of commercial industries, even though it hasn’t been that way for several generations. Modern beekeeping was begun in the 1850s by a minister in Philadelphia named Lorenzo Langstroth—thus modern, commercial boxes are called Langstroth hives. He took note of the bee space, which is a three-eighths-inch space between the combs, and if you maintain that space from comb to comb to comb, you can build these wooden frames so that you can pull them out and reorder them. Before that, bees were kept in skeps, [which are] straw domes, or gums, which are hollowed-out logs. You never went into the beehive. You just let the bees swarm, and that is what they’ve done for millions of years. With the new hives, you could simulate the swarm by pulling out extra bees, or brood, and rather than cutting out the wax and mashing it up, you could cut out the wax, spin it to remove the honey, and then give the wax back to the bees the next year for them to use again. Once they started doing that, all these pathogens appeared. The comb is like a filter, or the liver of the hive. It would soak up all the pesticides and pathogens causing these diseases. The main one was American Foulbrood, which began in the 1870s and 1880s. Once that happened every state decided to ban fixed-comb beekeeping, and to this day it is still illegal. That helped to create this monopoly for profit. It locked everyone into this standardized shape and new method. You just had to throw bees into a box and they did great. Several generations followed. How could your work be coordinated with other initiatives? On a community level I am trying to get bees everywhere, on each farm and in backyards, on rooftops. Once you get tied to keeping bees you look more at the flowering plants and health of the soil, and you start to realize what needs changing in your environment. You become more aware.